Car Accident? Tips To Save You A Ton Of Aggravation Later In Life. As another 2 feet of fresh powder gets everyone complaining I can start to understand why… Yes, the first 4 inches of snow each year looks pretty and definitely adds to the “seasonality” of Winter. However, the last report I heard is that we’ve been pounded with something like 71 inches of snow within the past 13 days. This presents some problems..well, aside from paralyzing all kinds of businesses and closing schools, the nearly unprecedented amount of snow can have a detrimental effect on the bodies of those among us who are not in good physical condition, which is the greater majority of people. 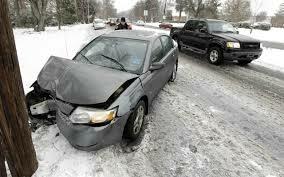 The number of car accidents naturally increases during periods of time when it snows out. With road crews working just about around the clock for the past 2 weeks the problem they’re having is trying to find places to put the snow. It’s a matter of physics, really. There’s just no more room! Drivers are having trouble seeing other cars because the roads are narrower than usual and the snow bankings are enormous…so by the time you see the car pulling out onto Main Street it’s just too late. When 2 heavy automobiles collide with each other there is a tremendous amount of energy created that either goes into crumpling sheet metal and/or causing physical injury to the occupants. The most common car accident injuries I see in my practice are musculoskeletal injuries such as neck pain, lower back pain, headaches as well as the victims having difficulty sleeping. There are several things that need to be addressed after a car accident has occurred. The first thing to do is to make sure everybody is alright. Call 911 to obtain the proper authorities to the scene to take care of properly documenting the accident as well as emergency care for anyone who may have been traumatically injured. You’ll also want to notify your insurance agent or carrier to let them know what happened. For those who were not critically injured I always recommend a Chiropractic check-up as well as a visit to the primary care physician. The primary care physician may be able to temporarily help a person suffering with neck pain, for example, by prescribing muscle relaxants and pain medication. However, because these chemicals are toxic to the body it is not a good idea to take these drugs for a long period of time. Also, prescription medication, in many cases, merely “masks” or covers up the underlying cause of the problem. But sometimes, prescription medication is necessary. A good Chiropractic check-up as soon after the car accident as possible…even if it was “just a fender bender” can often uncover seemingly small problems that may lead to BIG problems later in life. See, when spinal bones become misaligned, they can come in close proximity to the spinal nerves which causes the muscles in the surrounding area to tighten up in an attempt to keep you from damaging the nerve. Although this is a marvelous built-in mechanism from our Creator, we still need to get the spinal bone away from the nerve and the muscles will settle down on their own. 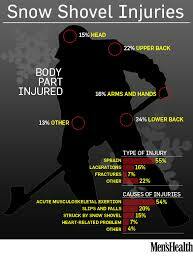 I recommend everybody have a Chiropractic check-up in general, but especially after a car accident has occurred. Why wait 20 years when the small problem finally gets big enough to get your attention? Deal with it now so it doesn’t ruin your life later. For more information visit my website at mugaverochiro.com. 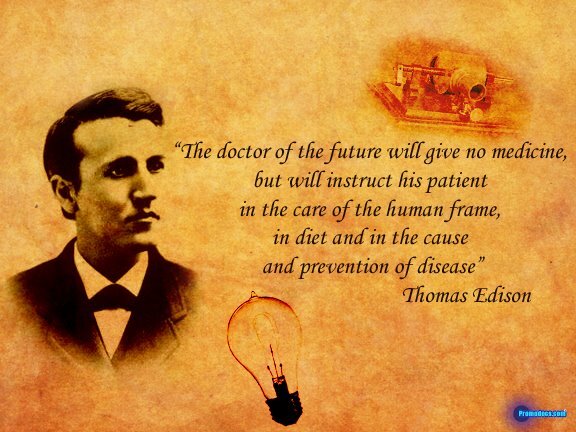 Edison was absolutely correct…sort of..
Mr. Edison knew all those years ago the importance of the spine and therefore the health of the nerve system, combined with a healthy, sensible eating program is the cornerstone of wellness. However, it seems that although we spend the most money per capita on “health care” we are still one of the fattest and sickest “civilized” countries in the world today. Most people, including the greater majority of my own patients, do not know what Chiropractic care is because most of them have not taken the 60-75 minutes to attend my “Chiropractic 101” in-office workshop that I give every Tuesday. I know, life is very busy… Therefore, most use my care as a temporary Band-aid to treat their back and neck pain. As soon as their pain goes away, they do, too. And, because they don’t know what Chiropractic is, most of them do not bring in their spouses and children to receive the incredible health-building qualities that regular Chiropractic care affords. Personally, I get checked and usually adjusted every week….not for aches & pains, but rather as a part of my wellness lifestyle. See, I know the importance of a healthy spine and nerve system and how every cell, tissue and organ in the human body has a nerve connection to it. Mr. Edison, an accurate thinker, knew then what even the most sophisticated medical doctors don’t know now…even with all of their education. In addition, Mr. Edison spoke of proper nutrition…what we have today is a far cry from what Mr. Edison had in mind, I’m sure. Again, I teach free in-office workshops on healthy eating, raw food recipes, juicing and green smoothies, but the attendance is weak. It seems the Big Pharma is winning…every time I turn around, somebody I know is being diagnosed with heart disease, cancer or diabesity…all frequently avoidable with lifestyle. Well, I raise my glass of carrot juice to Mr. Edison and his insights. I will keep fighting..keep plodding along to share the message of lifetime Chiropractic Wellness care and proper eating habits to anyone who cares to listen! For more information, please visit my website at mugaverochiro.com. 1. Warm up BEFORE shoveling. Seriously, do some light stretching and some breathing squats to prepare the major muscle groups for the job ahead. Don’t just roll off the couch after a two hour nap and start shoveling…you’ll be more likely to strain something! 2. Do less, more often. Try to get out there every hour or two in order to keep up with the burden to some degree. Shoveling 6 inches four times is a whole lot easier than trying to shovel 24 inches all at once. 3. Use your legs. Be smart about the biomechanics of shoveling by bending your knees to bring the powerful leg muscles into the game. It’s all about trying to minimize the amount of strain to the spine while utilizing the power and strength of the legs. 5. Hydrate. It can be easy to forget about drinking water when your huffin’ & puffin’ arctic air, but make sure you keep those large muscle groups hydrated…before, during & after. Dehydration leads to pulled/strained muscles, among other things. 6. Smile. I know this sounds weird, but the very act of smiling during an unpleasant situation signals the brain and endocrine system to release “happy chemicals” into your blood stream and you’ll probably feel a little better about the whole thing. Complaining about it doesn’t make it any easier. Besides, it’s just snow! 7. Have fun! We happen to live in an amazing part of the country where we have “snow days”. Get the whole family involved…play, laugh, be silly, make hot chocolate or tea…enjoy it! Please “share” this article with your contacts…you could really help somebody! For more information and useful health tips please visit my website at mugaverochiro.com. Great lunch recipe…Anti-cancer, high fiber and cabbage is great for the digestive tract. For more recipes visit my YouTube channel. Upon completing his training at Life University’s College of Chiropractic in 1999, Dr. Mugavero spent two years in Middle Georgia as an Associate Chiropractor in one of the largest practices in the Southeast. Within a very short period of time, Dr. Mugavero’s patient base began to swell. Although at first the majority of his patients were those people suffering with back pain, neck pain, headaches, numbness and tingling and leg problems, he soon gained a keen interest in treating the traumatically injured patient, especially those involved in auto accidents, work injuries and slip & falls. After the tragedies of 9/11, Dr. Mugavero decided to leave his highly successful practice in Georgia to move back to Massachusetts to be closer to family and friends. In 2002 he founded Mugavero Chiropractic, P.C. in Bradford, MA and once again enjoyed the success in helping thousands of people. Ten years later he began to expand his scope of practice by incorporating muscular rehabilitation. Dr. Mugavero’s service-minded philosophy asks, “What’s best for the patient?”. This driving philosophy has created a multi-faceted practice that is able to help a multitude of patients suffering from a wide range of problems. Dr. Mugavero and his wife Sallie, have two boys, Anthony (6) and Eric (4), who keep them very busy at home (and very tired!). In his spare time, Dr. Mugavero enjoys playing golf and relaxing at home with his family. In this video I show you how to make a delicious & healthy salad dressing for you and your family to enjoy….quick, easy….healthy Enjoy! For more videos check out my YouTube Channel.